So, I just saw one of the posts by Mik where he rounded up some pics from all the other guys who are wrking on the Storm Wardens project. How am I supposed to compete with that quality of work?!? Seriously, these guys are putting out some great stuff in a short period of time. A quick look through the Storm Warden blogroll shows that I am way behind everyone else with the project. 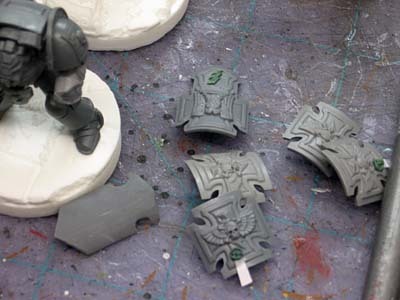 I was just about done building my squad when I saw what John over at Santa Cruz Warhammer has done with his storm shields. He was kind enough to send me 5 of those very same shields with the Terminator squad I'm putting together, but I originally elected to go a different route. I was going to use the standard Terminator storm shields that already have the lightning bolt on them. Trouble is, it's backwards from the chapter symbol and after seeing John's work, how can I not at least do the same thing he's done? I will say that I am happy that the guys appeared to have gone with a darker metal on their models, I was hoping I could do that as well. I was going to post lots of pics of my assembled squad because I was so proud of what I've done... but it looks like I have a bit more sculpting and converting to do now. Maybe next weekend I'll have something to show you guys. At this rate, I'll never catch up with the team. You need to head over to my blog for some much needed perspective on timeframes and general awesomeness. While I am very proud of my minis I baffle at the awesome stuff you put out. You sir are on that project because you are that good. I was lucky enough to have the Land Raider sent to me already assembled. Hitting it with the airbrush took me 30 minutes and now I'm on to the detailing. I'm fairly quick with vehicles and I think if I was doing a squad I'd be hard pressed to finish in time. You're doing some awesome conversion work - don't discount that! everybody else! Your converting work is awesome! Ron, stop. You're on this team because of the beautiful work you turn out. 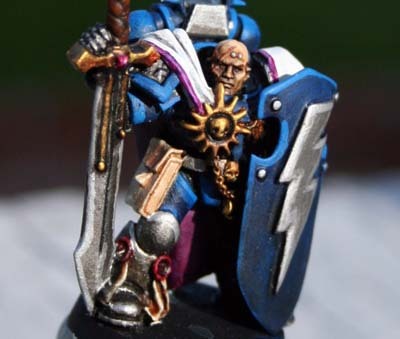 Agree that the termies will look even cooler with the other style of storm shield. Just keep focused on the end result.